It hasn’t been a good debut season for Christian Benteke at Liverpool. But things did get better as the Belgian striker pulled off a massive sting with a dive in the Crystal Palace penalty area, earning an undeserved penalty and converting from the spot himself to score the winning goal in a 2-1 victory. Liverpool didn’t play well, as expected, coming off their big win against Manchester City. They lost James Milner to a red card (two bookings) and conceded in the 48th minute as Joe Ledley put the home side in front. This looked like another example of Jurgen Klopp unable to find the tactics right for teams that don’t want a whole lost of possession. But the gods of football work in mysterious ways. In the 72nd minute Roberto Firmino, Liverpool’s best player in recent weeks, made the most of an awful mistake by Alex McCarthy, the Palace goalkeeper. Instead of a simple clearance, the returning-from-injury keeper simply passed the ball to the Brazilian, who calmly and clinically found the net against a stunned Palace defense. And the shocking finish topped that as Benteke, who came on in the 80th minute for Divock Origi, managed to salvage three points bringing Liverpool closer once again to a European spot (up to 7th now) by turning his desperate dive in the penalty box to a goal, maybe his most important since signing with the club. 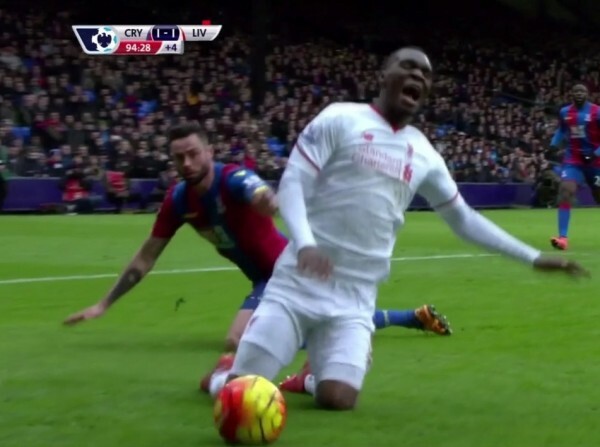 Just to make things clear: Damien Delaney did brush Benteke with his knee, but that isn’t the kind of contact that should earn a penalty. Benteke made the most of the gentlest of touches. Referee bought it. Game over.